Malibu Canyon Road offers some of California’s most stunning vistas, but the highway is notorious for its hairpin turns that can prove exceedingly dangerous at even moderate speeds. Last weekend, one motorist narrowly escaped plunging off the side of a steep cliff on the thoroughfare, when he apparently lost control of his sports utility vehicle while taking a curve. Malibu police officers responded to the accident at around 4:30 p.m. last Saturday, when a passing driver reported an SUV partially dangling off the road. The man’s vehicle had crashed through the concrete side rail and was nearly half way over the edge of the sharp embankment. Authorities say that the driver was confused and disoriented at the time of the crash, but managed to exit his SUV without serious harm. But in a cruel twist of fate, just as he safely escaped plunging to a certain death, he was struck by a passing tour bus as backed away from the wreckage. Los Angeles County Fire Department and California Highway Patrol told authorities that when they arrived on the scene, the driver was breathing and conscious. He was then transported to an area hospital for medical treatment. The crash occurred roughly half a mile south of the Malibu Canyon Road Tunnel, and is still under investigation by the California Highway Patrol. Authorities have not confirmed the driver’s current condition, who reportedly suffered non-life-threatening injuries when he was hit by the bus. Can the victim sue for damages? 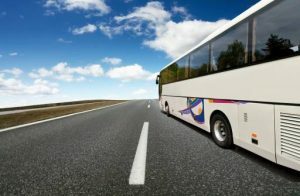 In order to pursue a personal injury lawsuit against the tour bus driver, there must be evidence of negligence such as excessive speeding at the time of the accident, alcohol or drug impairment, drowsy driving, or distracted behavior such as texting or using a cell phone. Litigation isn’t warranted in all bus accidents, but victims who do have a valid claim can demand compensation for all related economic losses such as medical bills, lost wages and rehabilitation. Legal action can also recoup money for emotional distress and loss of enjoyment of life, in addition to other, less tangible losses. Ellis Law is a team of award-winning personal injury lawyers in Southern California. Our mission is to advocate for the rights of victims who have been unjustly harmed through no fault of their own. For more information about your rights to legal compensation, we are happy to extend free case reviews to all prospective clients. Call us anytime, toll-free at 310-641-3335 to speak with an attorney at Ellis Law today.